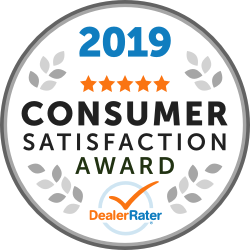 Eatontown, N.J. (January 24, 2019) – Circle BMW, the region’s premier BMW dealership, has been awarded a 2019 DealerRater Consumer Satisfaction Award, an annual recognition given to auto dealerships that deliver outstanding customer service as rated by online consumer reviews. DealerRater, the world’s leading car dealer review website, created the Consumer Satisfaction Award program to let online car shoppers instantly spot dealers that provide high-quality customer service. Circle BMW has achieved consistently high scores on the DealerRater website, placing it among the top dealerships nationwide. Online shoppers visiting Circle BMW’s dealer page will find a “2019 Consumer Satisfaction Award winner” badge on their profile to instantly recognize it as a first-rate dealership. Circle BMW, owned and operated by Tom DeFelice since 1981, is dedicated to excellence in all phases of the BMW ownership experience: sales, service, parts, accessories, lifestyle products and lifetime customer support. Serving customers in Central New Jersey, Circle BMW is one of the tri-state area’s leading luxury automotive dealerships and a four-time recipient of the prestigious BMW Center of Excellence Award for achieving outstanding levels of performance and customer service. In addition to new vehicles, Circle BMW offers Certified Pre-Owned vehicles that meet demanding standards for resale. Our award-winning Service Department is among the top in the nation and is proud to employ the largest staff of BMW Master Technicians in New Jersey. Circle BMW is one of the largest BMW authorized stocking dealers of original equipment parts and accessories in the region. Learn more at circlebmw.com and connect with us on Facebook.com/CircleBMW, Twitter.com/circlebmwsales, Instagram.com/CircleBMW and YouTube.com/circleBMWTV.